Prepare, Like They Do at Faire! The Renaissance Faire is just another trade show! As casual and spontaneous as it may look from the guest’s point of view, a lot goes into making sure all who enter have the best experience they possibly can that day. In order for that to happen, strict rules are placed on both the vendors and actors. Weeks before The Renaissance Faire begins, the organizer presents three mandatory workshops for new vendors: Orientation, Costuming and Elizabethan Language. 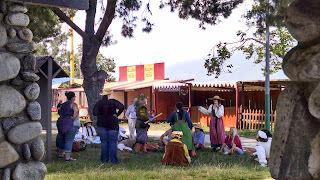 Every day one hour before Faire opening, all royals, puritans, beggars, street jesters and all stage other actors are required to attend a brief meeting, preparing them for the theme of the show and special events of the day. Exhibiting can be very expensive if your staff is not ready and able to accomplish your trade show goals. Your sales representatives are bright and great at what they do, but they can’t read your mind or you theirs. Let your staff in on your expectations and give them the tools to perform. Most probably they won’t be speaking Elizabethan; they need to be conversing in a language to bring your customers closer to a sale. They won’t be a peasant, a royal, or a pirate, yet they ought to be dressed the part of representing your company brand with the proper attitude, focus and attire. Prepare your merchants to increase sales in and out of the booth. A jousting fight to the death is optional!